We understand the relationship between a woman and her shoes and aim to cater for their every need. We understand as seasons change so does the fashion, that favourite pair you purchased two seasons ago may no longer be available. 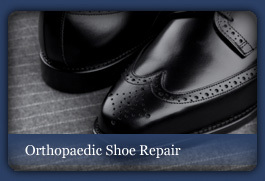 But don't despair because we work so closely within the footwear manufacturing world we are normally able to offer original parts and services otherwise unavailable to other repair services. 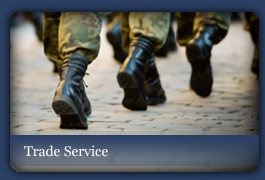 We offer so many services it would be impossible to mention them all, so if you do not see what you require then please email us and we will endeavour to help. Our first recommendation is to add a thin layer of rubber to the sole without damaging or covering the brand name/logo. 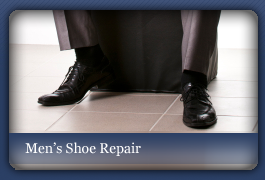 adding a protective rubber sole prolongs the life of your shoes. Stylishly thin (less than 1mm) this rubber top sole protects the outer sole from wear and tear. Water resistant and skid proof, taking this preventative step will greatly increase the life of leather soled shoes. We offer only the best quality colour matched soles applied by bench men with over 30 years experience. Ever snapped or scuffed the heel on your favourite pair of Choos? From Prada to Primark we can rescue your beloved heels. With over a hundred different styles we can match the original heel block almost perfectly and recover them in most colours and textures including leather, suede, satin and enamel. Uniquely patterned, special fabrics and stoned or studded heels will need to be assessed before repairs are carried out. Email us a picture of your damaged heels for a quote today! Leather lovers will find our full sole service irresistible. 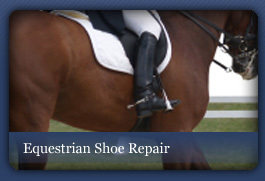 offering a complete new finest quality sleek leather sole to your favourite shoes or boots. Applied with excellent attention to detail by our highly skilled team we will have your tired soles looking as fresh as the day you bought them! Full length and Half Length Zips. There's nothing worse than a busted zip in your faithful boots. Our zip replacements are carried out with painstaking detail and expert care. Whatever the length, whatever the colour we can replace zips and zip pulls in all kinds of footwear and bags. We use only the best quality replacements and stitch them in with colour matched nylon thread using the original stitching holes to minimise damage to the bordering leather. Email us with any queries and a member of our team will be happy to help. Don't let snapped elastic or broken buckles keep you out of your much loved Louboutins. we can replace elastic straps/ panels, lengthen or shorten straps, replace buckles or straps, Velcro, press studs and much more. Email for more information on our extensive range. List of designer/fashion shoes we repair: Fendi, Jimmy Choo, Gucci, Christian Louboutin, KG, D&G, L.K Bennets, Ferragamo, Fratelli Rossetti, Manolo Blahnik and many more!